I would not normally write about how to get around a city we visit. We have often used Hop-On-Hop-Off (HOHO) buses to explore a new city and get an overview of a new place. When we are in a city, we generally use public transportation and don’t rent a car. If Uber is an option, we have found that to be a much better option than a taxi. Usually we just pick a transportation option that fits with our destinations for the day. But you need to think in advance about ways to get around Dubai. Much like many cities, including Toronto at home, the city is built to accommodate cars. One of the first things that surprised us about Dubai was the traffic. Whether we were out in the day or at night, traffic was everywhere. 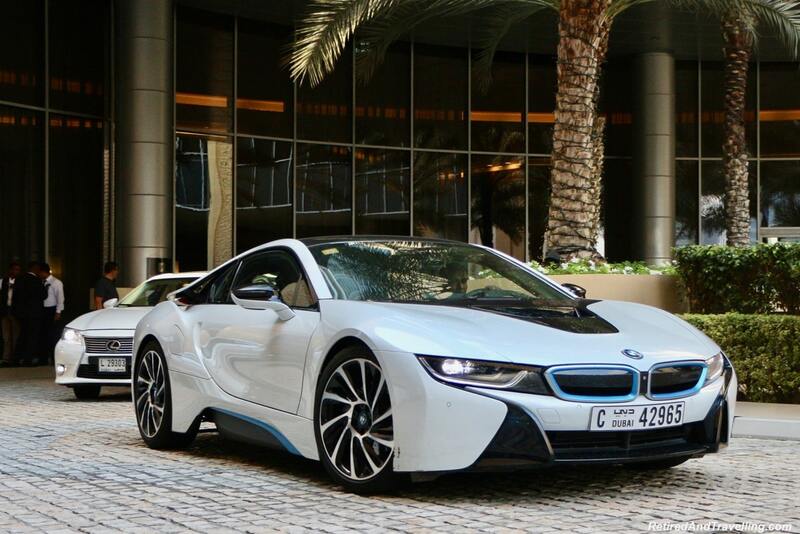 If you are a car junky, you will find pretty much every luxury car in Dubai. 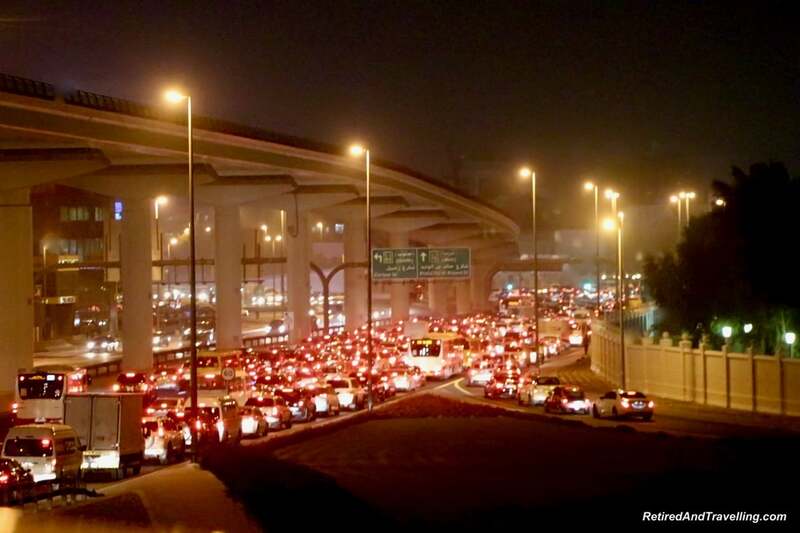 The car dealerships line the expressway beckoning to people sitting on already clogged roads. 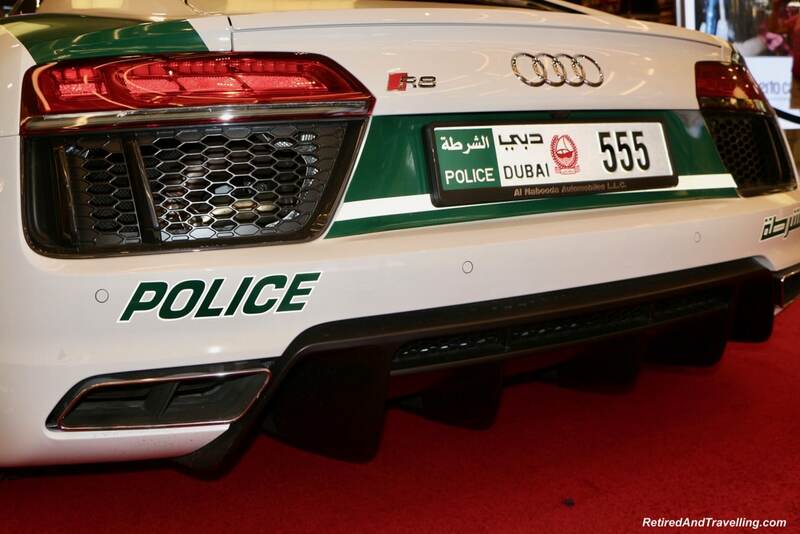 It was not then surprising when we found that the police in Dubai had fast expensive cars to keep up with the cars on the road. 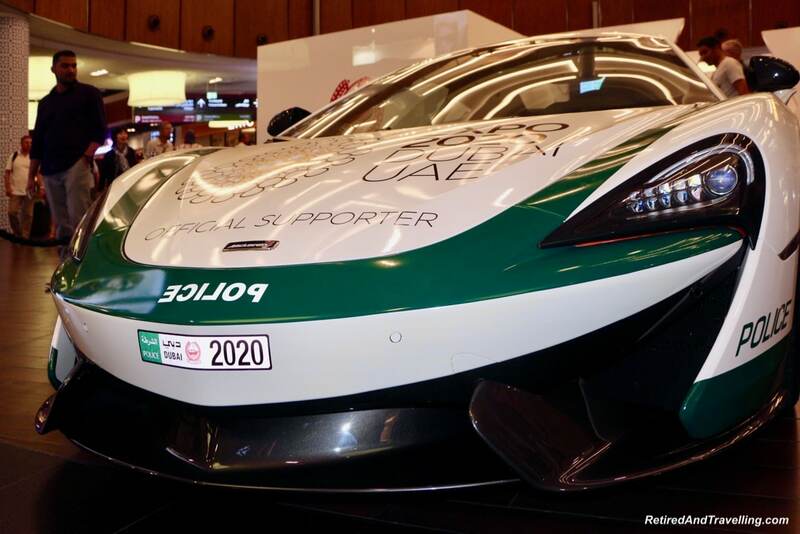 We were at the Dubai Mall and saw an interesting display of police vehicles. Yes, one was an Audi and the other a McLaren. With all of this traffic, we never went by car if we could avoid it. Taxis or Uber will be slow and expensive. We got picked up by a van when we went out of Dubai for our desert adventure. It took hours before we left the Dubai city boundaries. The only other exception was our trip in from the airport. Who would turn down the free luxury ride you get when you fly First Class with Emirates? 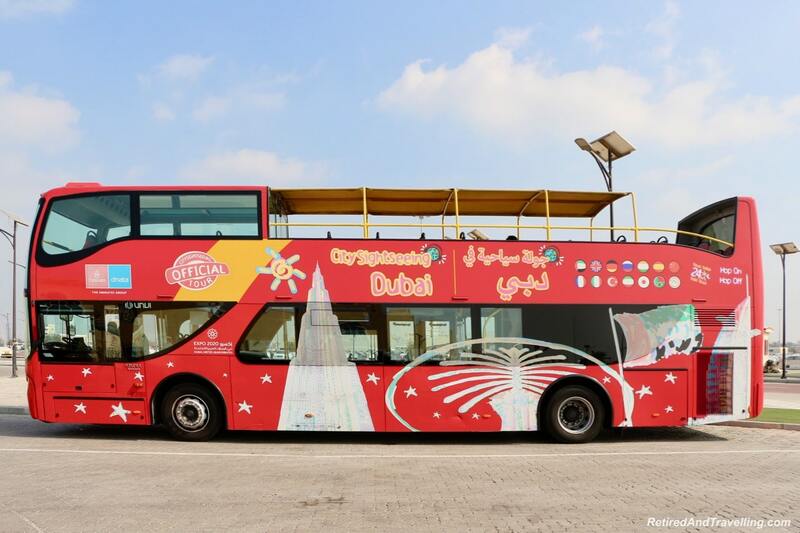 When we first arrived in Dubai, we got a two day ticket for the HOHO bus. That was a mistake. The bus crawled in traffic for two days. We saw so much less on the two days than the routes offered. If you do get a HOHO ticket, get it for a couple of days or you will never cover all of the routes. When you think about ways to get around Dubai, I would not be looking at travel by car or bus. When we returned the second time to Dubai for New Years, we stayed out in the Marina district. There is a local tram system that took us around the Marina district. 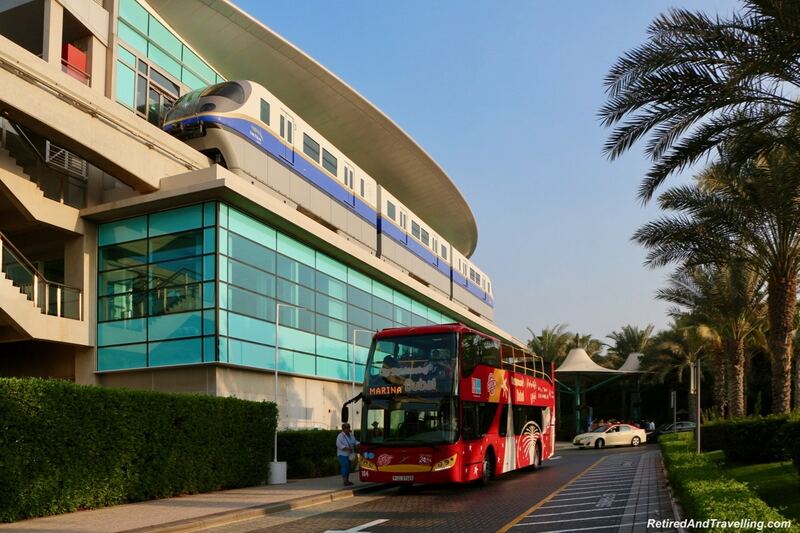 This then connected with other tram systems that could even get you out along Palm Jumeirah to the Atlantis Dubai Resort. The local Marina tram also connected into the main line that runs along the side of the highway. This was a great way to get into the downtown area. 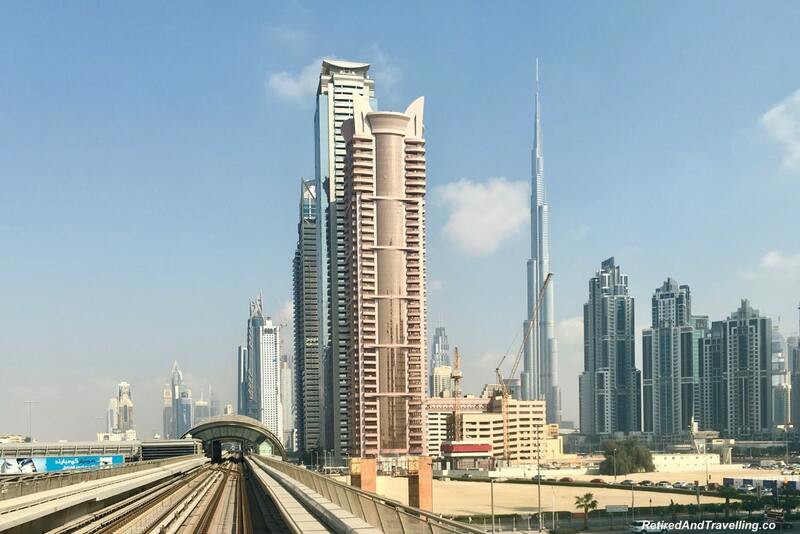 We used the tram to visit the Dubai Mall and the Burj Khalifa. 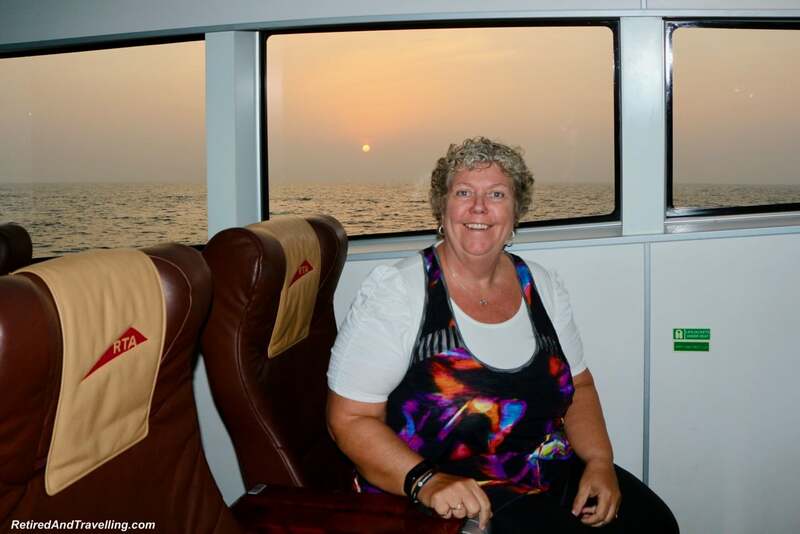 We peered eagerly out of the large windows for views of Dubai. A few tips if you do use the tram system. 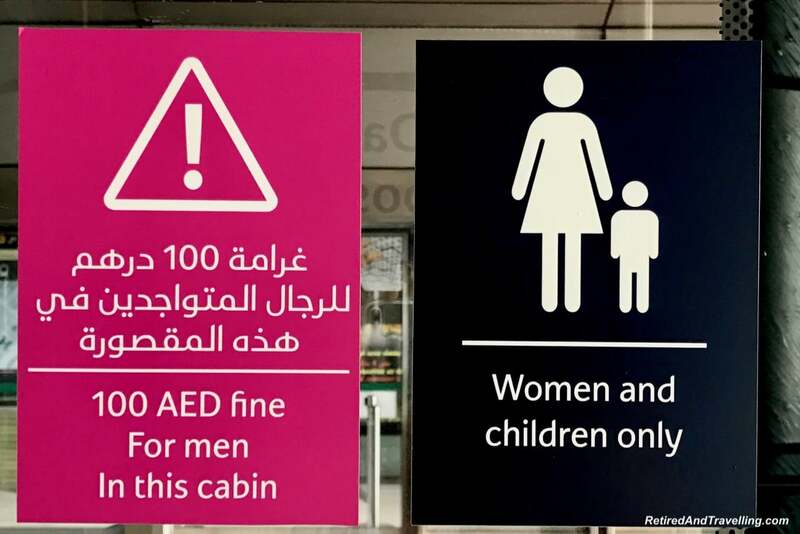 First of all, there are special cars that are for women and children only. The tram cars are well marked. And the cost is high if you don’t follow this. The other cars are ok for a couple to use. One interesting thing we found was that there were gold cars for more private and luxurious tram travel. We peeked into the gold tram car but did not buy that class of ticket. We were not sure if you could just buy it for one ride. 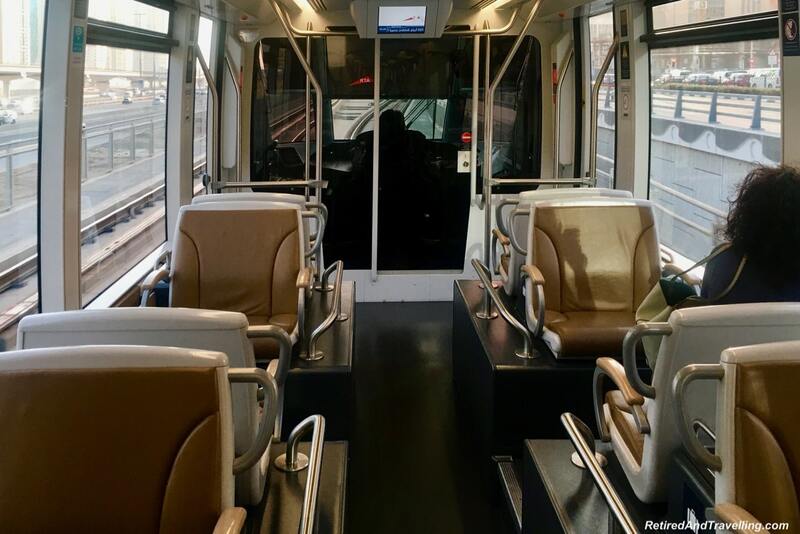 The tram system is a great way to get around Dubai if your destination is close to the transit routes. The trams were fast, went on a frequent schedule and were spotlessly clean. 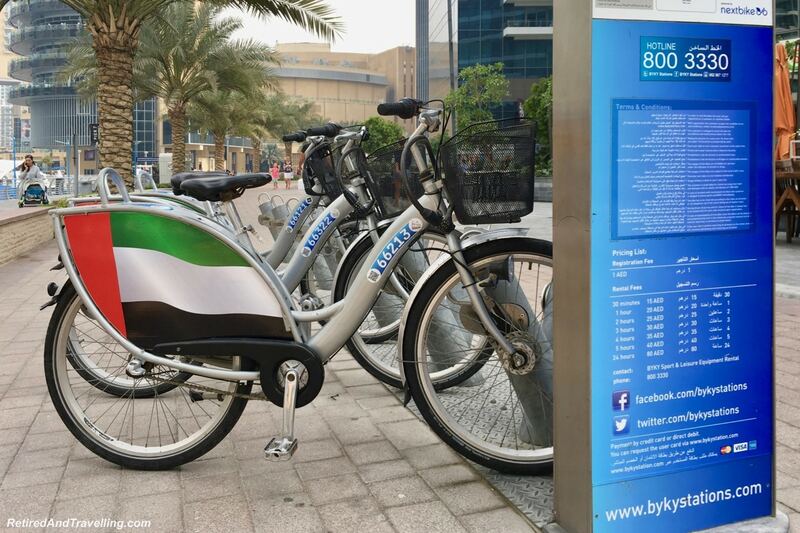 When we stayed in the Marina district, we found several different places where we could rent a bicycle. The systems were largely automated so that you could pay with a web site or app. The bike spots were well signed to show you how to get and return a bike. One day we rented a pedal car to explore the Marina area. This was a very fun way to move over quite a long distance if you don’t want to ride a bike. Of course, we also did a lot of walking in Dubai. There is so much to see and do. We didn’t want to miss a thing! 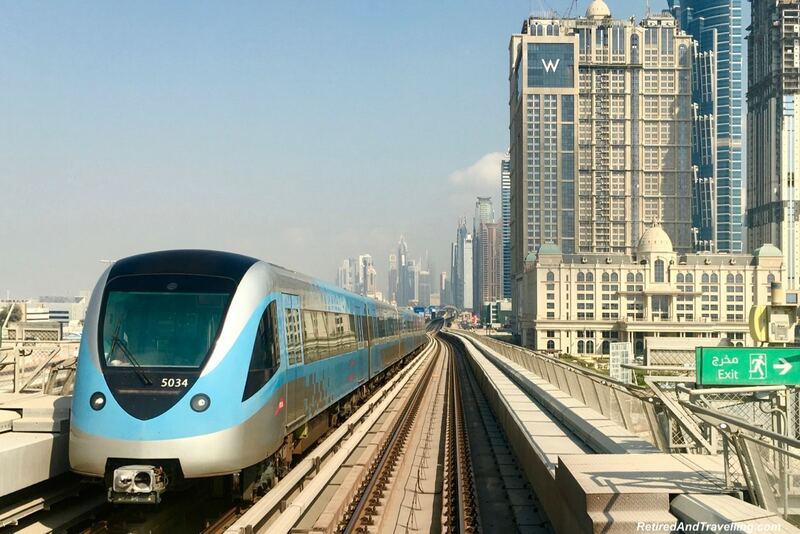 Once you are close to your destination, there are lots of options to get around Dubai. 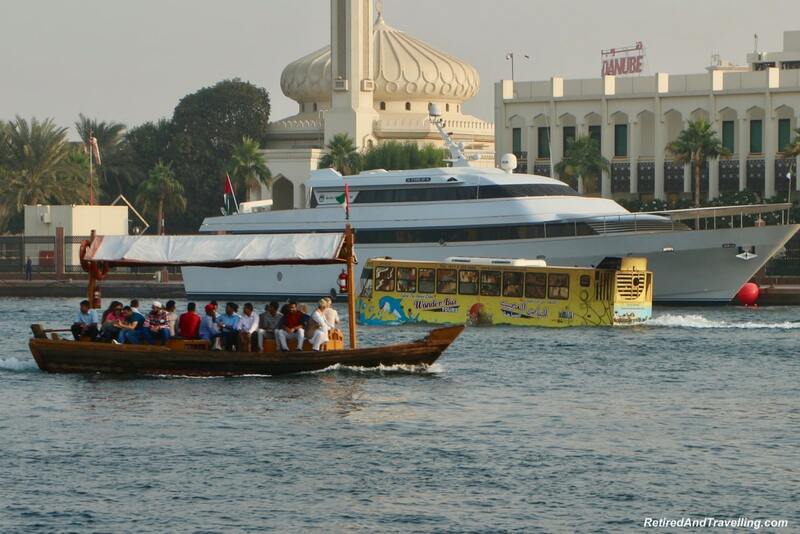 We took water tours on the Dubai Creek and in the Marina area. This was a great way to catch the views along the waterways. 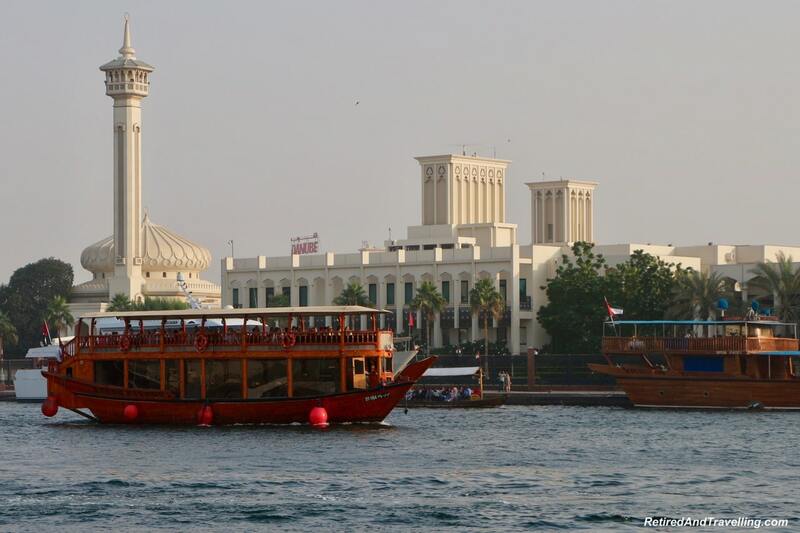 On one sightseeing trip we went by classic dhow boat. On our second sightseeing cruise, we took a modern ferry that was converted to a cruise boat at night. 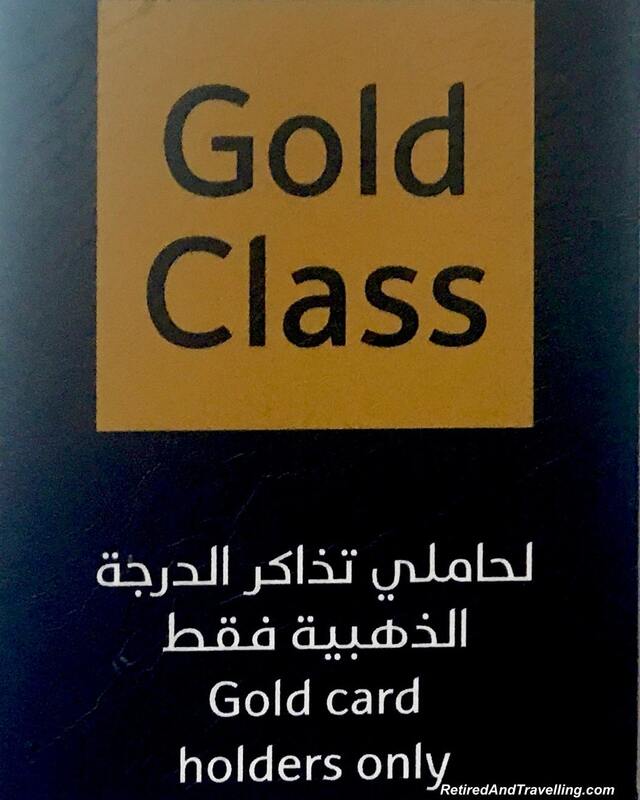 And like the tram system, you can buy gold class tickets on the ferry. When we did our night cruise on the ferry, we took advantage of gold seats. 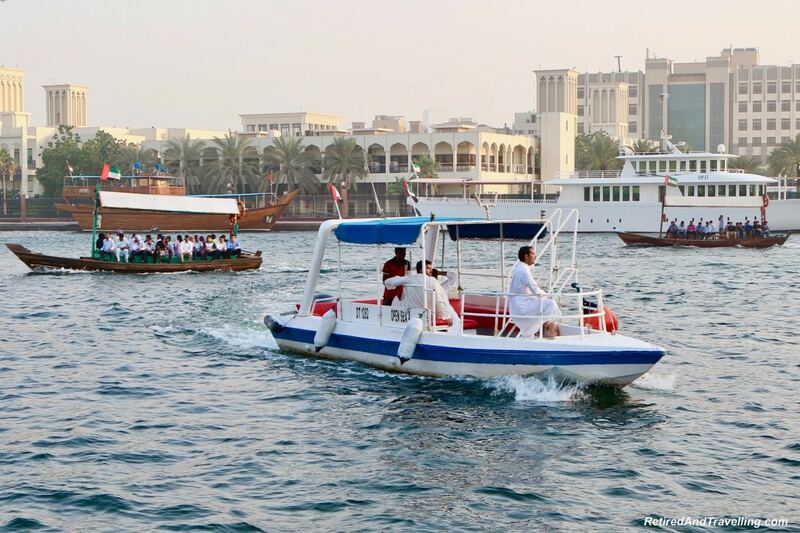 If you are crossing a narrow stretch of water, there are water taxis that work the waters. The locals often pack these water taxis. There are generally a few stops around the waterway. 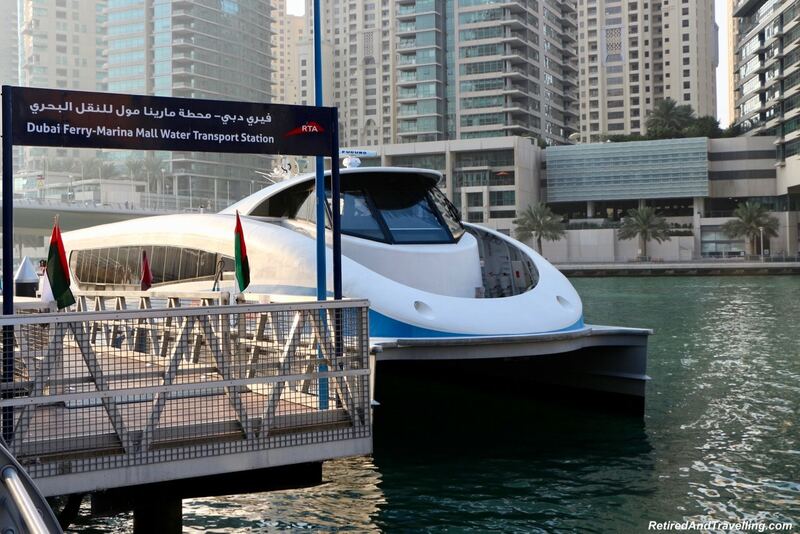 A much more expensive option are private water taxis used as personal transportation (e.g. flagged like a cab). 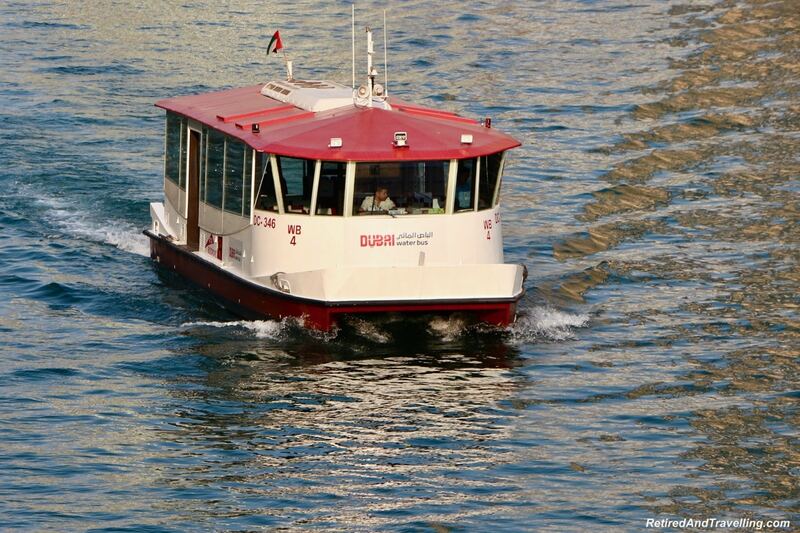 The Dubai ferry is a great choice if you want to transit longer distances along the waterfront areas. 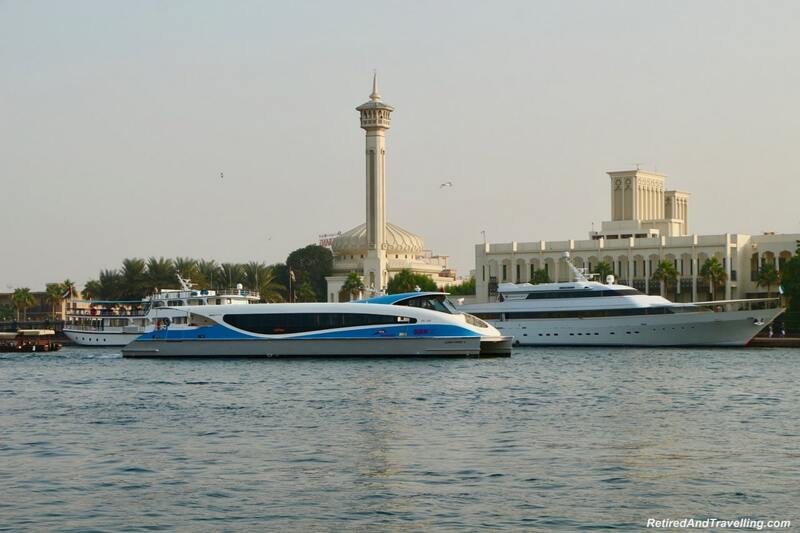 There are multiple stops between the Marina district and the Dubai creek. It was far faster to transit this distance by ferry than by car. And by public transit, this route would require many different transfers and routes. 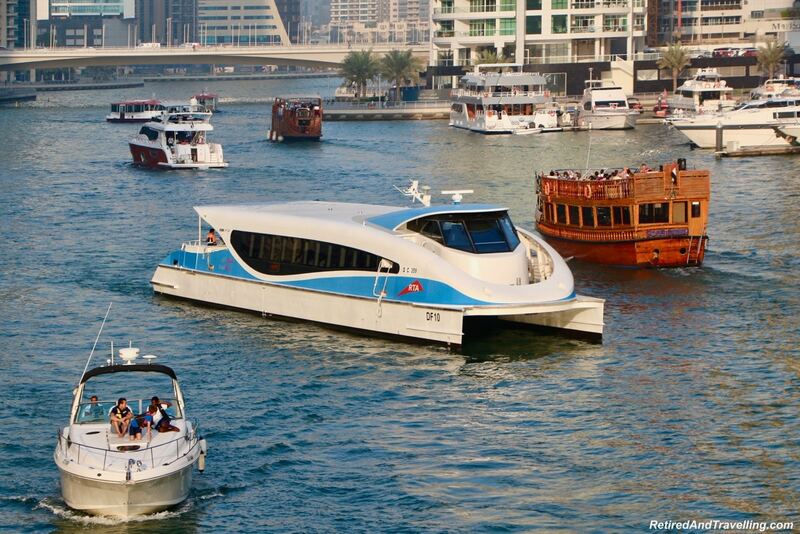 Travelling along the waterways is a great way to get around Dubai. It is often a much faster trip than any other option if you are going to areas along the waterfront. 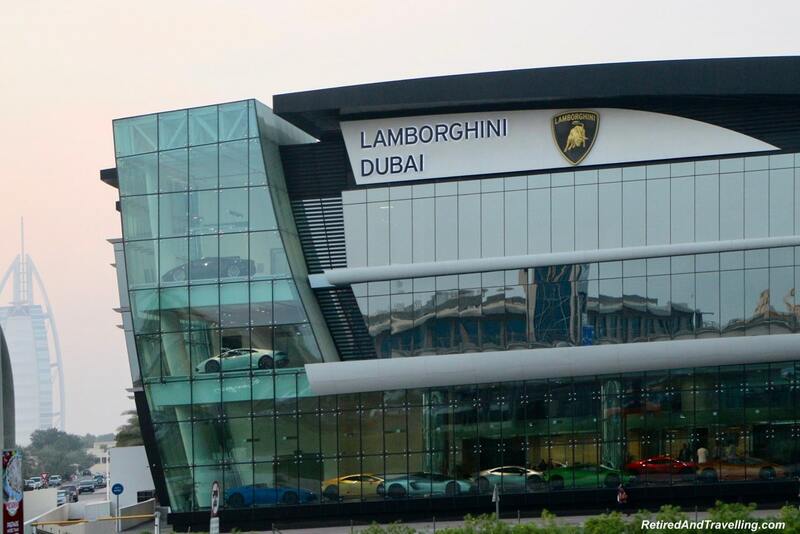 On our first stop in Dubai, we lost a lot of time stuck in traffic. The HOHO routes are great but it takes so long to transit that we saw far less than we expected. 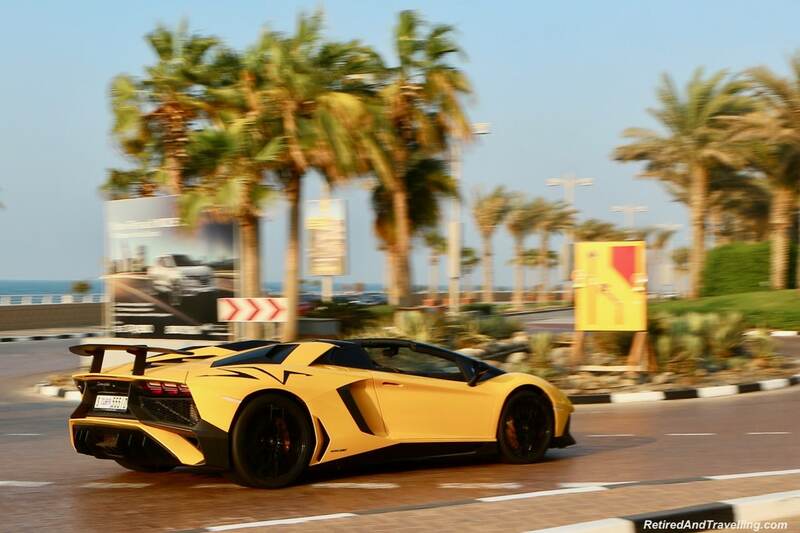 When we returned to Dubai for New Years, we were better prepared to get around Dubai. There was so much we wanted to see and do in Dubai. We checked out the public transit options in advance. This was particularly important because we stayed out of the downtown area. As we walked around the Marina district, it quickly became evident that there were many places we could visit so much easier by water. 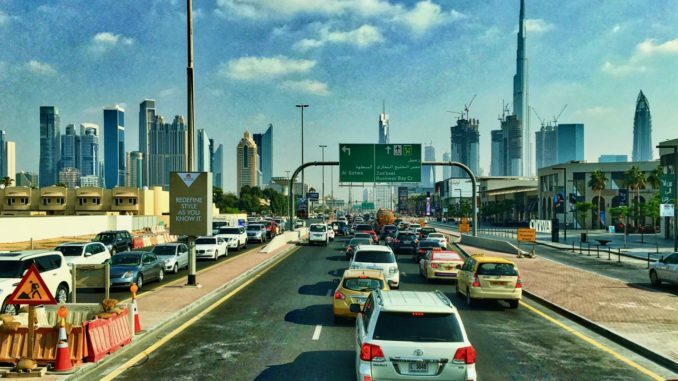 We certainly tried to avoid getting stuck in traffic on our second visit to Dubai. 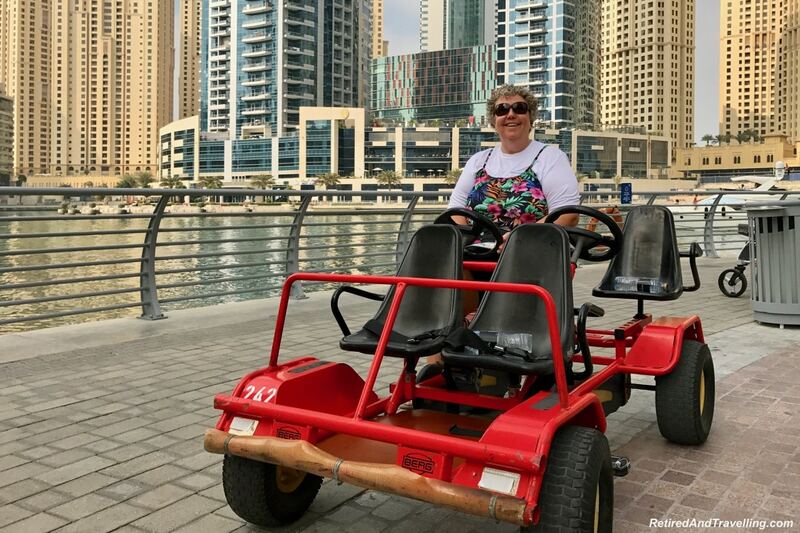 Which ways to get around Dubai did you use? What way would your recommend always be avoided?